I love scones. The minute I saw this recipe I knew this recipe was for me. This recipe has everything that is good in a scone. Heavy cream, shredded cheddar cheese, bacon, and lots of pepper. But the star of the show and one of our favorite products; Knorr. 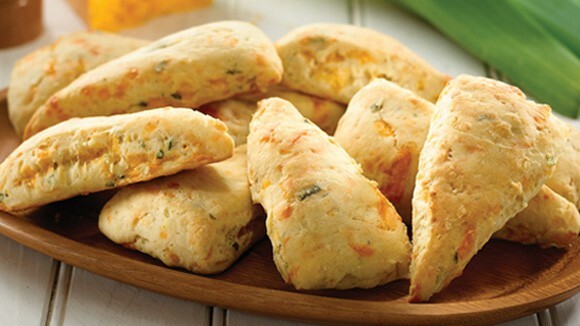 Savory cheese and leek scones are made with cream of leek soup by Knorr. I have used Knorr products in everything from dips to meatloaf to vegetables but never scones. Boy, have I been missing out! This recipe is wonderful! The scones turned out delicious. Perfect with a bowl soup, stew, chili or anything else your little heart desires. This recipe makes two dozen delectable scones. They freeze well also so you might want to make an extra batch. Combine Knorr cream of leek dry soup mix with water in a small saucepan with wire whisk. Bring to a boil over medium heat, stirring constantly. Reduce heat to low and simmer 2 minutes. Remove from heat; then stir in cream; set aside. Preheat oven to 400 º Line 2 baking sheets with parchment paper. Combine flour, baking powder and pepper in a large bowl. Stir in cheese and bacon if using. Stir in soup mixture. Stir until mixture just holds together, stirring in 1 teaspoon of cold water if needed. Gently knead 8 to 12 times. Shape or pat into two 8-inch circles. Cut each circle into 12 wedges. Place on prepared baking sheets. Chocolate Mint Brownies perfect for your St. Patrick’s Day celebration or because you need to get your chocolate/mint fix.